Decades ago when I was learning to fly I always found airspace so challenging to understand. It was this 2D world that didn’t click for me. Years later now as an educator I’m taking that same airspace and making it 3D for everyone to get a better understanding of complex airspace. Enjoy the video. There is no way around it. Airspace is tough. However allow me to present you with some scenario based training and an amazing 3D animation of complex airspace to help you better understand it. Do You Need a Visual Observer? Does the FAA require you to have a visual observer on your crew? When do you typically use a VO? Thats the topic of this weeks video. The new recurrent test is VERY heavy on charts and airspace. So in todays video we take a quick review of each. I believe all of us as remote pilots should create a checklist and here is why. Few things in the land of the FAA are more confusing than Class E Airspace. As if we don’t have enough “types” of Class E Airspace to know in manned aviation the FAA decided to further categorize Class E airspace for unmanned aviation. In today’s video we take out our VFR sectional chart and break down the types of Class E Airspace that pertain to us as Remote Pilots. Also be sure to like/subscribe to us on Facebook and YouTube to enjoy our livestream on September 27th at 7pm “Practice Part 107 Recert Test” I’l be asking actual questions and you’ll be working to provide your best answers. The part 107 recurrent exam brings with it an entirely new set of questions and some new topics. 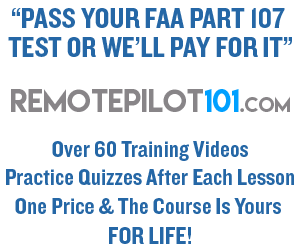 In this quick video I share with you one trick FAA part 107 recurrent/recert test question. In this episode Ethen and I will help you interpret what the FAA says about inspecting towers, safely maneuvering around guy-wires and altitude restrictions.